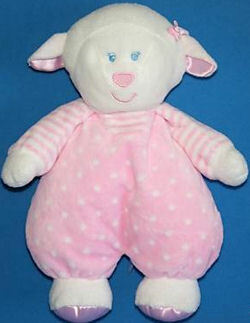 I am looking for a Kids Preferred white lamb wearing a pink outfit with stripes on the sleeves and polka dot jumper. We had lost my 3 year old’s lamb “baby”, and it was the first time she’d been without it since birth. She was devastated and our night was long, to say the least. I’ve been looking to try and replace it, but I couldn’t find it anywhere until I found your website…………..
We did find the “baby” again, but I’d rather not have that again if we can help it. We can’t spend much on a backup, though. Hurry only 9.99 so far with 4.75 shipping. if you are still searching? Hope this helps. Please let me know where I can find one of these for my niece. Thank you.